Traditional letterpress printing requires physical letters, cast from metal or carved from wood, which get inked and pressed into paper to make a print. In the last post, we took a look at the process of making type from metal (if you missed it, click here). In this installment, we’ll see how it’s created from wood. From the International Printing Museum website. Wood came to be used as a material for making letters for printing primarily in the 1800s, when the printing and advertising industry became more widespread. Imagine trying to lift a big “Wanted”-poster-sized chase of metal type — pretty darn heavy! (See the photo of a Civil War recruitment poster.) Letters carved and routed from holly or maple were MUCH lighter, and could be made MUCH larger than their metal counterparts. Here at the Press, we’re fortunate to care for and print with a nice selection of wood type, most of which was made between 1875 and 1910. If used with plenty of TLC, it’ll outlast us (just like our presses)! Some of the largest wood type we have in our collection at St Brigid Press. And some of the smallest wood type here! A fabulous wood type called "Bradley" that we are glad to care for and print with here at the Press. Also in our collection, a wonderful old wood calendar set, with days of the week, numbers, and months. The year is 1914. One of our most enjoyable projects using wood type here at the Press: a limited edition poster celebrating the raptors that migrate along the Blue Ridge Mountains. A lot of vintage type, however, either went to the scrap heap decades ago, is just too damaged to print well anymore, or is too scarce and expensive for most printers to purchase. Thankfully, there are a few excellent folks who are making brand new type from wood today! Here is a great interview (4 mins) of Geri McCormick of Virgin Wood Type (Rochester, NY), by Frank Romano. Want to know more about the wonderful world of wood type? 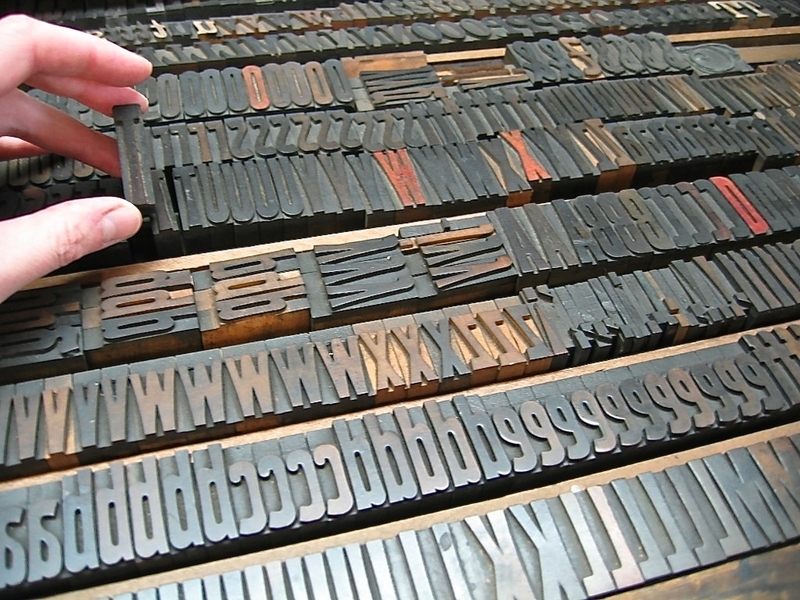 “What is Wood Type?” ~ An excellent intro on Hamilton's website. Thanks for joining us on this journey into type! Please sign up below for more occasional dispatches from letterpress land!